Samaritan’s Purse will provide cleft lip surgeries for as many as 50 South Sudanese men, women, and children at the Juba Teaching Hospital from November 3–8. A team of 12 doctors and nurses, Give To Help Repair Cleft Lipshailing from the United States, Canada, Kenya, and the United Kingdom, plan to run two operating tables. Some beneficiaries will come from around Juba, while Samaritan’s Purse pilots will fly in other patients from remote areas in six different states of the country. One family is walking 25 miles just to reach a small airstrip where they will be picked up and returned. Children born with a cleft lip in South Sudan are often abused, prevented from going to school, and made to feel worthless because of the false belief they are possessed by evil. Over 200 patients have had repairs done over the previous three years and the results can be life-altering. Not only are the health and cosmetic improvements dramatic, many encounter the Great Physician while in Juba. This year the team anticipates adding cleft palate repairs to the docket. Please pray for the success of this program and for God to be glorified through it. You can follow regular updates from the field on Facebook, Twitter, and Instagram during the first week of November. 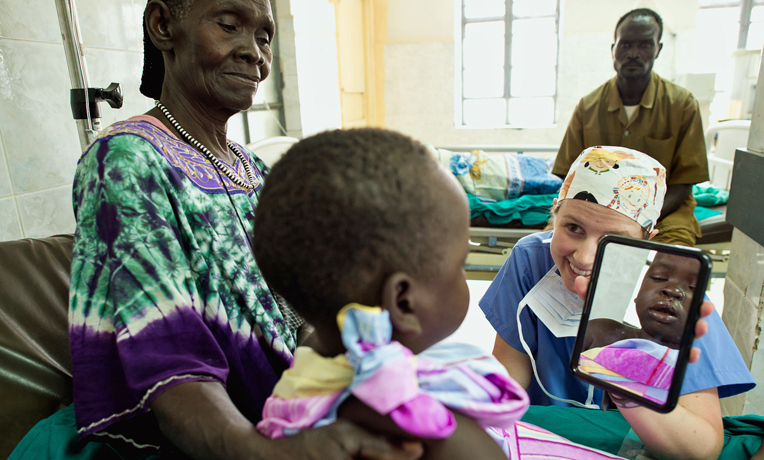 Mend a Cleft Lip Samaritan’s Purse sends specialized teams to places such as South Sudan and Bolivia to provide outpatient surgery for hundreds of patients. Your gift of $250 will enable us to cover the cost of this life-changing procedure so we can show these boys and girls how precious they are in the eyes of God.